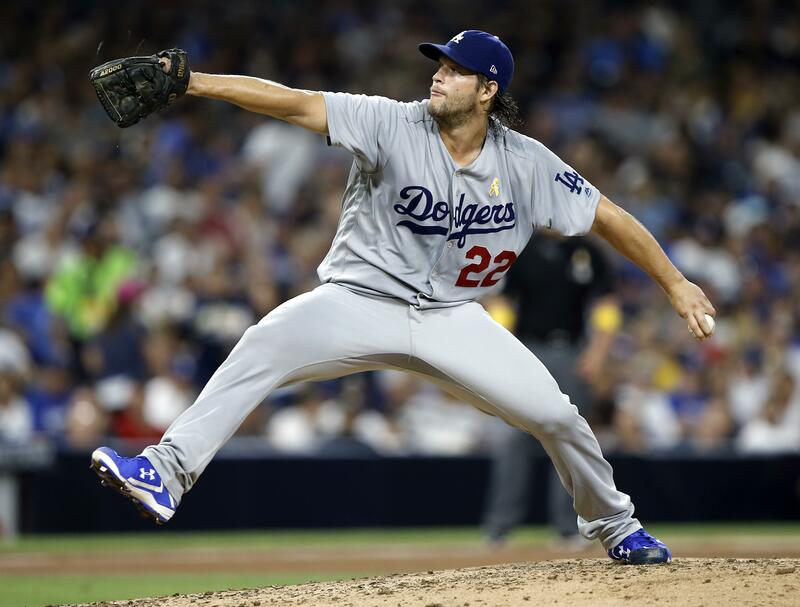 Fri., Sept. 1, 2017, 11:55 p.m.
Dodgers ace Clayton Kershaw was sharp in his first start in five weeks, pitching two-hit ball for six innings as the Los Angeles Dodgers beat host San Diego 1-0 Friday night to snap their season-high five-game losing streak. Kershaw (16-2) hadn’t started since July 23, when he was pulled after two innings with a strained lower back that landed him on the disabled list. The lefty won his career-best 12th straight decision, striking out seven and walking none. Kenley Jansen pitched a perfect ninth for his 36th save. The Dodgers, who have the majors’ best record at 92-41, snapped their longest losing streak since April 2016. Chase Utley hit an RBI single in the sixth off rookie Dinelson Lamet (7-6). Indians 3-10, Tigers 2-0: Mike Clevinger pitched six sharp innings and visiting Cleveland swept a day-night doubleheader, routing Detroit for its ninth straight win. The A.L. Central-leading Indians won the opener on Francisco Lindor’s tiebreaking single in the ninth inning. Clevinger allowed three hits, struck out six and walked one. Buck Farmer (3-2) took the loss. The Tigers loaded the bases with two out in the ninth inning against closer Cody Allen (2-6), who had allowed the tying run in the eighth. Joe Smith took over and retired Miguel Cabrera on a line drive to Lindor at shortstop for his first save. Red Sox 4, Yankees 1: Doug Fister dominated for seven innings and visiting Boston backed him with three home runs to beat the Yankees and extend its A.L. East lead. Eduardo Nunez, Andrew Benintendi and Hanley Ramirez each homered as the Red Sox opened a 5 1/2-game edge over New York. Sonny Gray (8-9) gave up all three homers. Orioles 1, Blue Jays 0 (13): Jonathan Schoop doubled home Manny Machado in the 13th as host Baltimore outlasted Toronto. It was the eighth win in nine games for the Orioles, a surge that’s put them just 2 1/2 games behind the New York Yankees for the top A.L. wild card. Machado led off the 13th with an infield hit off Aaron Loup (2-3) and Schoop followed with a liner to right-center. Cubs 2, Braves 0: John Lackey pitched seven crisp innings, Javier Baez’s daring baserunning paid off again and host Chicago beat Atlanta for its fifth straight win. Lackey (11-10) allowed three hits, struck out five and walked none while improving to 6-1 with a 3.83 ERA in nine starts since the All-Star break. The 38-year-old righty retired his last 16 batters. Pedro Strop and Brian Duensing worked the eighth before Wade Davis finished the four-hitter for his 28th save in 28 chances. Anthony Rizzo added two more hits as N.L. Central-leading Chicago won for the 11th time in its last 14 games. He batted .355 with seven homers and 30 RBIs in August, powering the Cubs to a 17-12 record and a major league-best 191 runs for the month. Atlanta lost for the fifth time in seven games, wasting a solid start by Mike Foltynewicz (10-11). Brewers 1, Nationals 0: Jimmy Nelson scattered three singles and struck out 11 over seven innings, and host Milwaukee beat Washington. Nelson (11-6) tied his career high in strikeouts. Rookie Josh Hader struck out the side in the eighth inning and Corey Knebel struck out the side in the ninth for his 32nd save in 37 chances. Knebel has not allowed a run in his last 19 outings. Royals 7, Twins 6: Mike Moustakas homered for the first time since mid-August, Brandon Moss also went deep and visiting Kansas City held off Minnesota in Minneapolis. The Twins had won four in a row. They remain one game behind New York for the top A.L. wild-card spot. Melky Cabrera tied a season-high with four hits for the Royals, who won for just the second time in eight games. Kelvin Herrera allowed a two-run single to Joe Mauer in the ninth, but Scott Alexander struck out Eddie Rosario with the bases loaded for his second save. Jason Hammel (7-10) got the win. Dillon Gee (1-2) took the loss. Phillies 2, Marlins 1: Philadelphia was shut out for seven innings by major league newcomer Dillon Peters but rallied for two runs in the ninth and extended host Miami’s losing streak to five. Brad Ziegler (1-3) took a 1-0 lead and a 13-inning scoreless streak into the ninth, but Maikel Franco doubled and Jorge Alfaro tied it with a single. Andres Blanco’s groundout scored another run. Philadelphia rookie Rhys Hoskins went 0 for 3 with three strikeouts, ending his 13-game hitting streak. Juan Nicasio (3-5) made his Phillies debut a day after being claimed on waivers. He retired Giancarlo Stanton to end the eighth and Hector Neris got his 18th save. Reds 7, Pirates 3: Adam Duvall drove in two runs to lead visiting Cincinnati over Pittsburgh. Asher Wojciechowski (4-3) earned the win in relief after moving to the bullpen from the rotation. He pitched two scoreless innings. He is 2-0 with a 1.74 ERA in 10 relief appearances this season. Gerrit Cole (11-9) was touched for five earned runs and six hits in six innings after pitching five innings in a 1-0 victory over the Reds in his last start. Rangers 10, Angels 9: Carlos Gomez scored the go-ahead run in the eighth on a wild pitch and Texas moved up in the A.L. wild-card race, holding off Los Angeles in Arlington, Texas. The matchup took 4 hours, 33 minutes, setting franchise records for both teams as the longest nine-inning game in club history. The Rangers stopped the Angels’ three-game winning streak and closed within three games of Minnesota for the second wild-card spot. Los Angeles is 1 1/2 games behind the Twins. Diamondbacks 9, Rockies 5: Taijuan Walker struck out a career-high 10, Daniel Descalso homered and surging Arizona beat Colorado in Denver for its eighth straight win. The Diamondbacks increased their lead to 4 1/2 games over the Rockies for the top N.L. wild-card spot. Walker (8-7) lasted only five innings due to a high pitch count. Kyle Freeland (11-9) took the loss. Mariners 3, Athletics 2: Mike Leake overcame a shaky beginning to throw seven innings in his Seattle debut, and the Mariners snapped a five-game losing streak by beating visiting Oakland. Acquired from St. Louis earlier in the week, Leake gave the Mariners the kind of performance they desperately needed to remain on the fringe of the AL wild-card race. Leake (1-0), who was 7-12 with St. Louis, allowed two runs in the first inning, but held the A’s scoreless the rest of the way. Edwin Diaz pitched the ninth for his 31st save. Mike Zunino homered off Sean Manaea (9-9). Rays 3, White Sox 1: Logan Morrison hit his 34th homer and drove in three runs, Blake Snell pitched into the seventh inning to win his third straight decision and visiting Tampa Bay topped Chicago. Morrison, who had three hits, has five homers in his last five games. He’s hitting .480 (12 for 25) with 11 RBIs during that span. Snell (3-6) allowed one unearned run and induced three double plays in 6 2/3 innings. Alex Colome got the final three outs for his major league-leading 41st save in 46 opportunities. Reynaldo Lopez (0-2) allowed three runs on five hits with seven strikeouts in six innings. The White Sox have lost four in a row. Cardinals 11, Giants 6: Kolten Wong hit a tiebreaking single during a six-run ninth that sent visiting St. Louis over San Francisco. Randal Grichuk homered for the third straight game for the Cardinals. Tyler Lyons (3-0) pitched the eighth for the win. Sam Dyson (1-2) took the loss. Published: Sept. 1, 2017, 11:55 p.m.